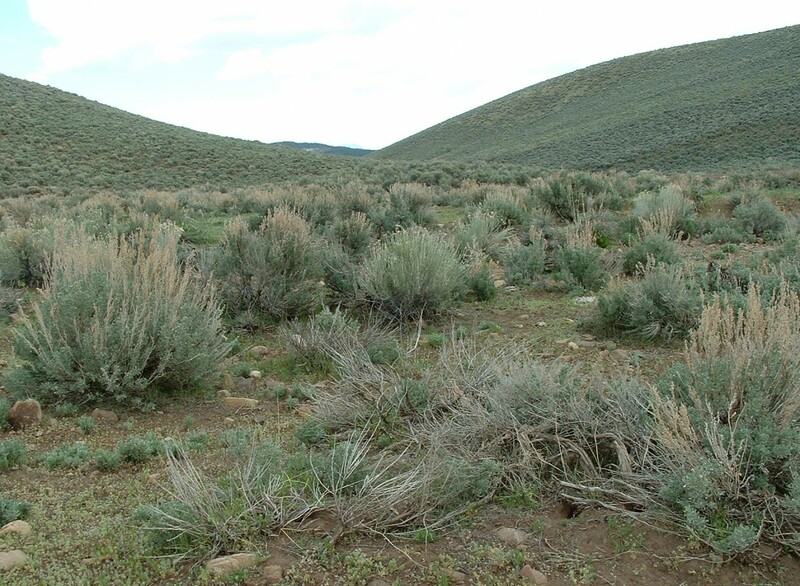 Healthy sagebrush habitat in western Utah is required for the sensitive populations of Greater Sage Grouse (Centrocercus urophasianus) that live there. I have still never seen a wild sage grouse. In Utah I’ve seen Blue Grouse, Ruffed Grouse and introduced Asian Chukars, and could likely identify a sage grouse if I saw one. Maybe someday I will. 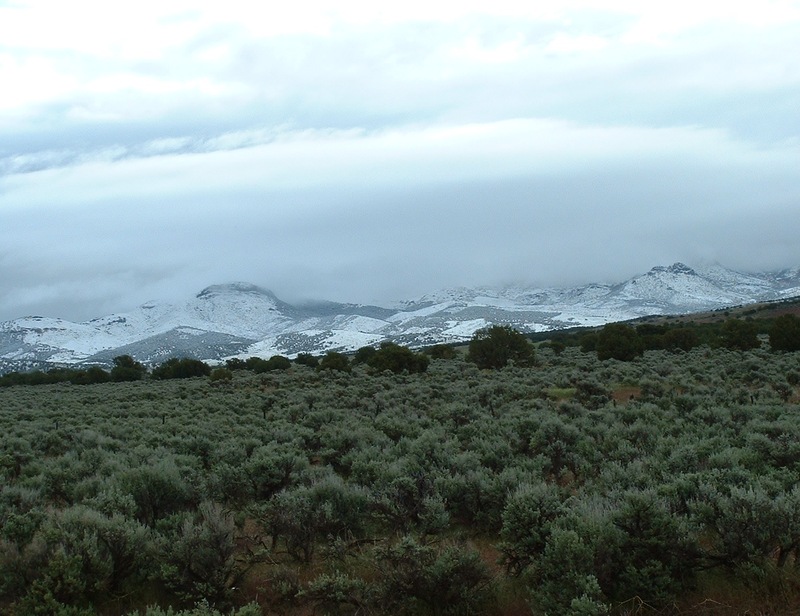 A friend of mine involved in sage grouse conservation asked me about photographs I’ve taken that document juniper and sagebrush habitat, and this post is what I came up with. 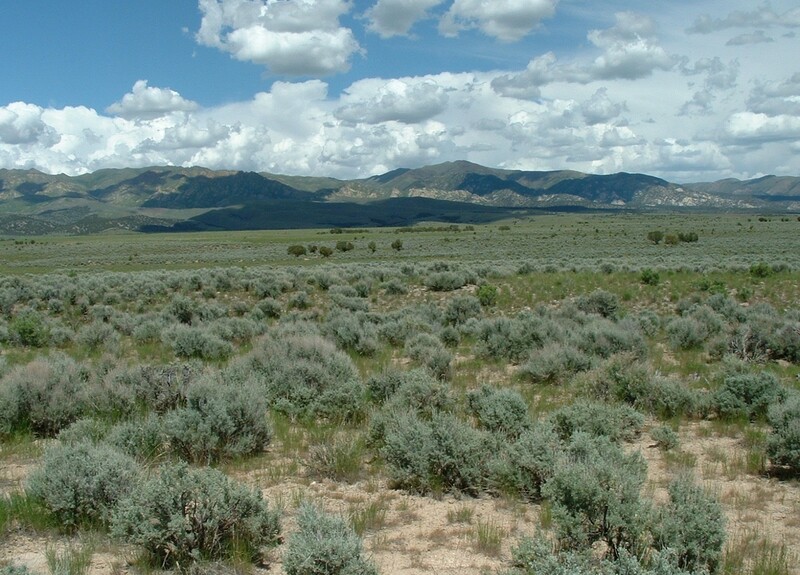 Much of the “Black Mtns” looks like these rolling hills of sagebrush. 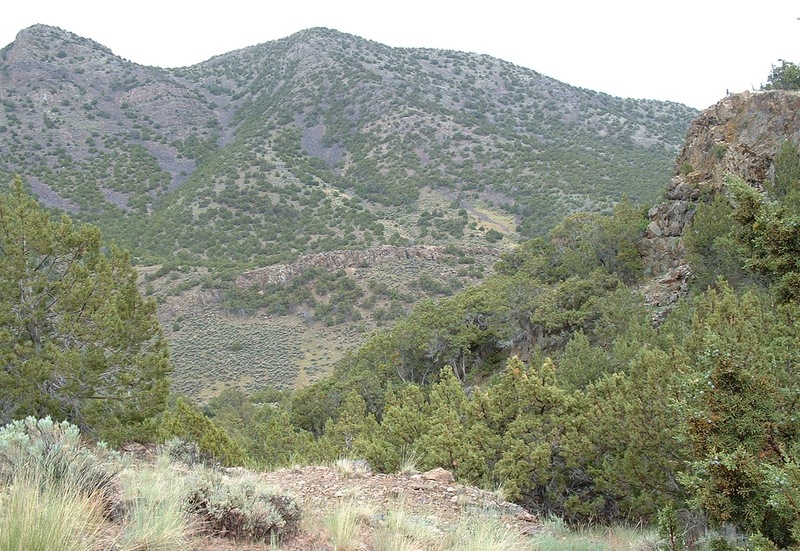 Pockets of pinion-juniper occur in sandier and more sloping areas, at elevations both below and above that shown here. I’ve been told that sage grouse are known to utilize habitat like this in this mountain range. Federal, state and university biologists have worked for many years to prevent western USA’s sage grouse populations from crossing the threshold to threatened status as part of the federal Endangered Species Act. Loss of habitat is considered the main issue. Millions of dollars have been spent on habitat mitigation efforts to improve sage grouse habitat in Utah and neighboring states. Detailed field studies have gained insights on the behaviors of wild sage grouse and their requirements for successful reproduction. Juniper’s “encroachment” into sagebrush (Artemisia tridentata) is one factor contributing to loss of habitat for sage grouse. 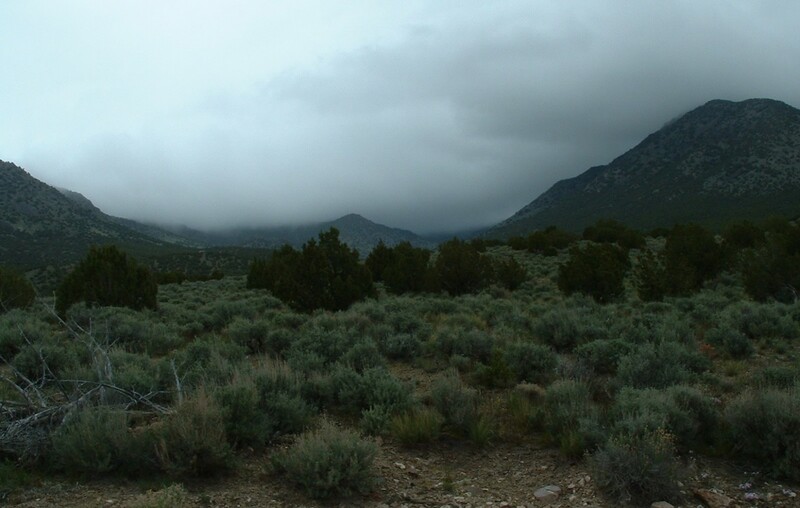 Decreased precipitation, invasive plant species, fire suppression, sand overgrazing in some areas by cattle (and perhaps also deer, elk, wild horses?) 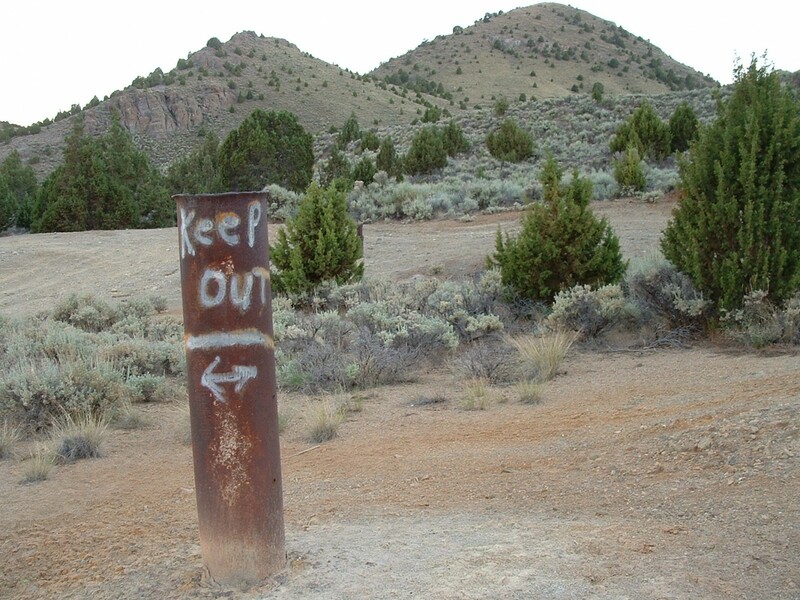 are thought to have encouraged juniper’s “encroachment” during recent decades. 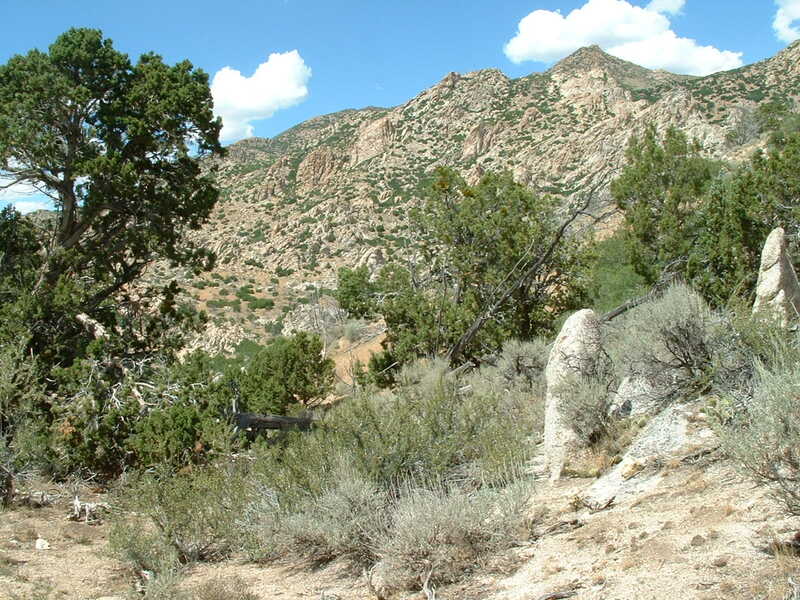 The species of juniper in all this post’s photos is the Utah Juniper (Juniperus osteosperma). I think some botanists consider variants within this species to be different species, but I’m glad to follow the simpler format that Utah holds only 3 species of native juniper: osteosperma, scopulorum (Rocky Mtn Juniper) and communis (Common Juniper). I consider any juniper not scopulorum nor communis to be osteosperma. J. communis occurs in moister, higher elevation areas, stays short and shrubby, and does not mind some shade. I’ve seen it ~9,000-11,00 ft elevation in Utah’s Wasatch and Uinta Mtns. I’ve seen J. scopulorum on slopes at ~7,000-10,000ft elevation in those ranges and also Utah’s San Pitch Mtns & Hurricane Cliffs. It’s the drier-adapted, lower-elevation J. osteosperma that is the encroacher into sagebrush. 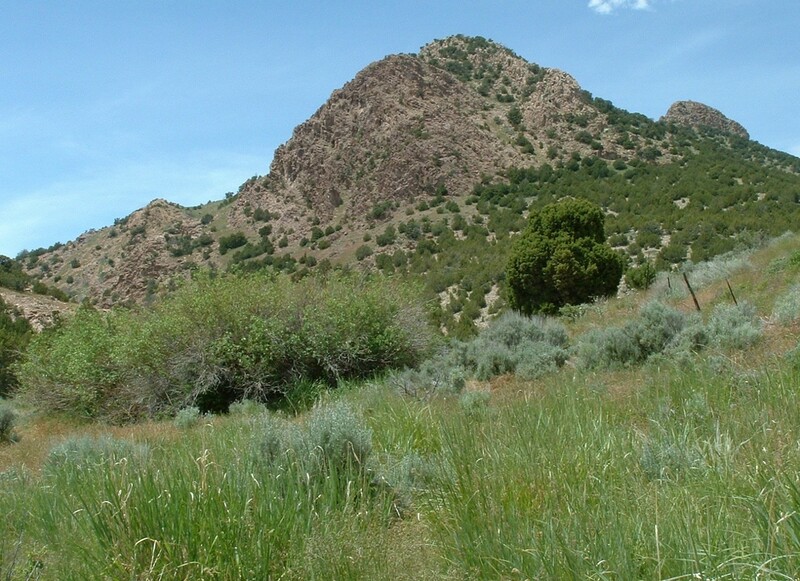 It occurs in much of the western half of Utah, in ~5,200-8,500 ft elevation. Sometimes, pinion pine (usually singleleaf pinion–Pinus monophylla) accompanies Utah Juniper’s encroachment into sagebrush. Then, it’s not only juniper but “pinion-juniper” that encroaches. But pinion has a narrower elevation window than juniper, and is less tolerant of heat & drought. 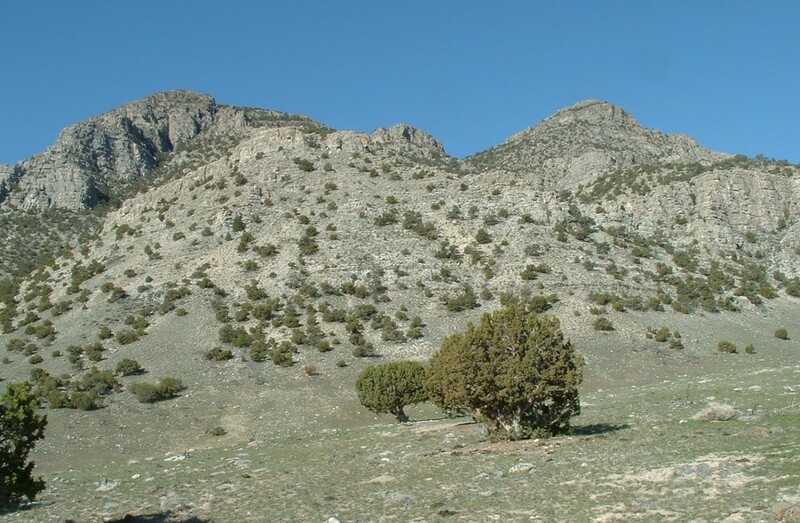 In a some ranges in the NW quadrant of Utah (Stansbury, Onaqui, Sheeprock & Simpson Mtns) there are no or very view pinion pines joining stands of juniper even though habitat seems appropriate for pinion too. You can see the juniper skeletons on the far slope, here. These canyons on forest service land are used for cattle grazing. The cattle drink from nearby, spring-fed creeks. I assumed the juniper removal here was intended to benefit cattle. 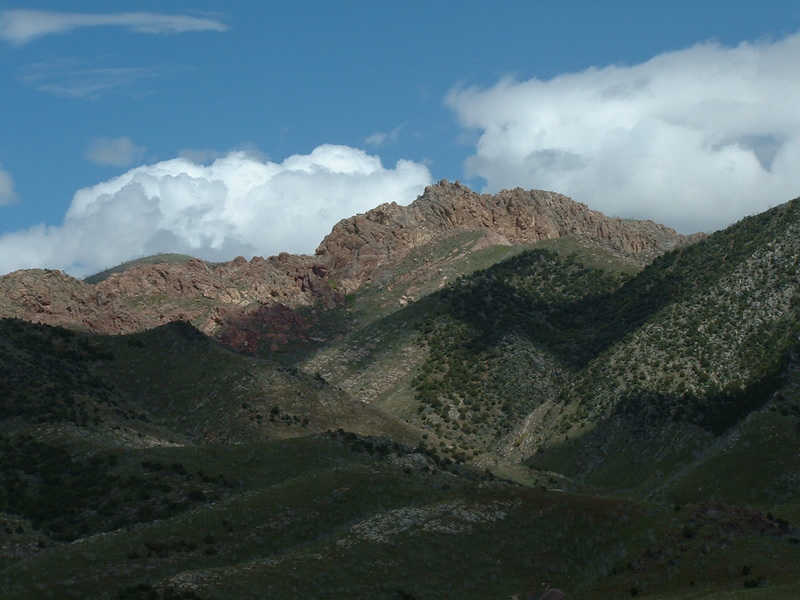 The East Tintic Mtns here heavily mined, mostly for silver, in previous decades. As in other areas in Utah, cities sprouted around the mines and then faded when the mines did. Notice the complex technology employed here to prevent children & animals from licking the colorful orange dust. The junipers in the East Tintics are joined by plenty of pinion, but at this particular spot there seem to be no pinion. Here in the south side of the Sheeprocks there are large expanses of juniper (without pinion) sprawling into the sagebrush. 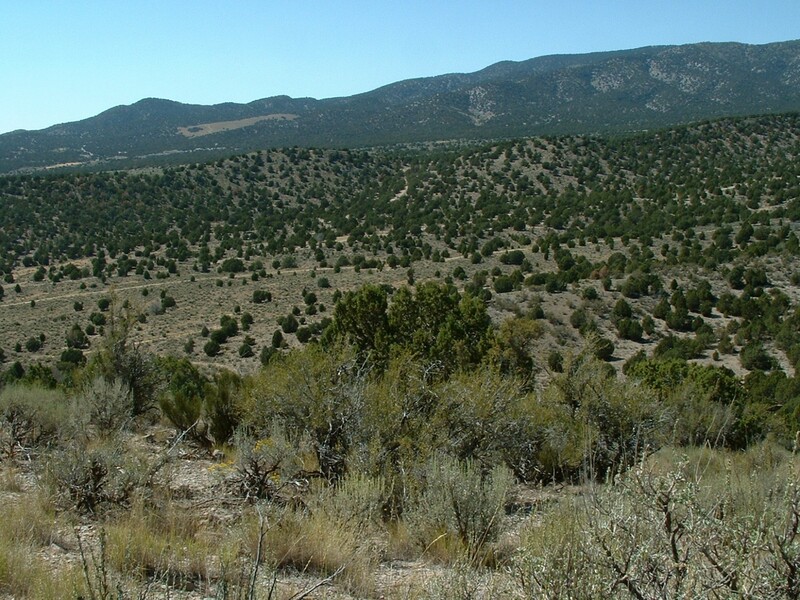 But this particular area, where you can see both juniper and sagebrush, is higher and near the upper-elevation limit of the juniper. Up here, juniper and sagebrush share the slopes with cliffrose and gambel oak. 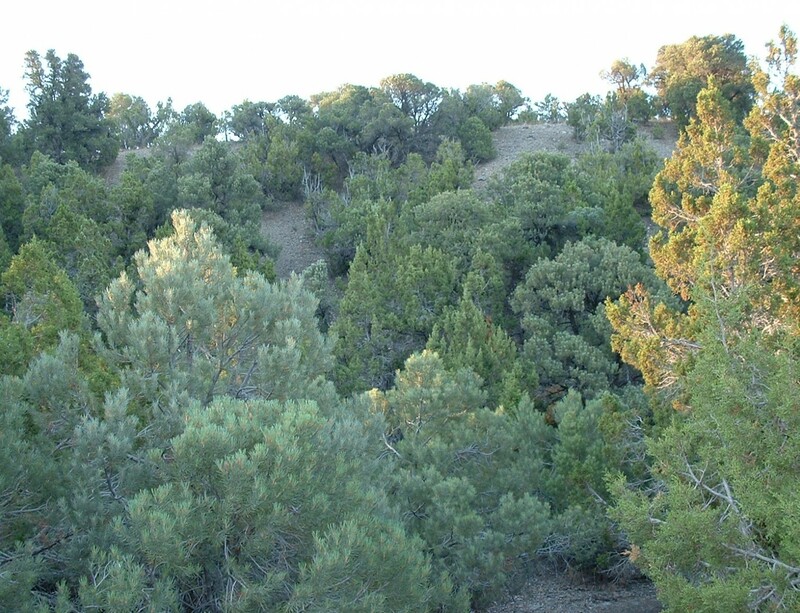 Here in the southern Oquirrhs, the dark green belt of pinion-juniper includes plenty of singleleaf pinion. 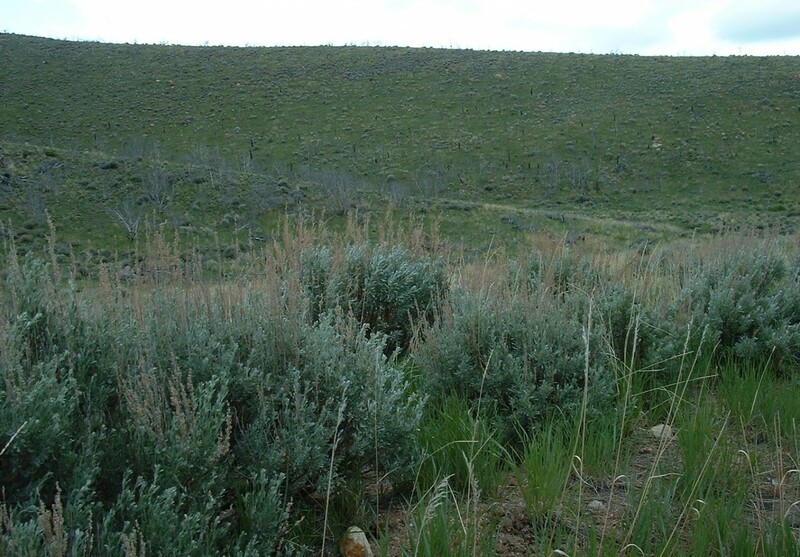 There are many areas in western Utah where just a few junipers are scattered in the sagebrush. Perhaps if such junipers were not culled, juniper would spread faster in this habitat? Here’s another area of the southern Oquirrhs. Notice the more blue-green pinion pines, among the junipers, here. In this part of the Sheeprocks, the juniper has filled in to use most of the available area. Notice the belt of dark green juniper on the far foothills, here. Some areas of juniper here have been eradicated (at least temporarily). 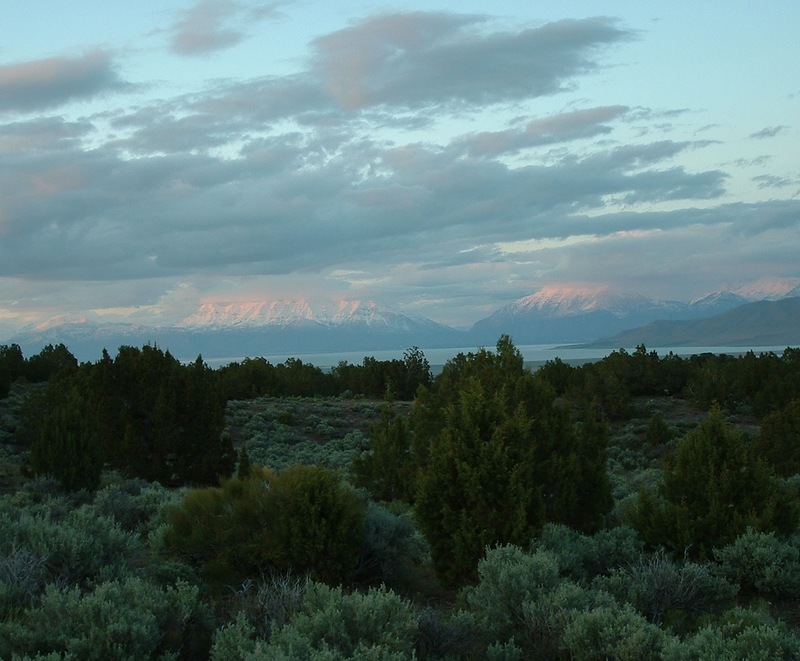 In this view, the two most prevalent plant species by far are juniper and sagebrush. No pinion at all, here. I suspect these steep slopes are too steep to provide optimal sage grouse habitat, even if the juniper were decreased. 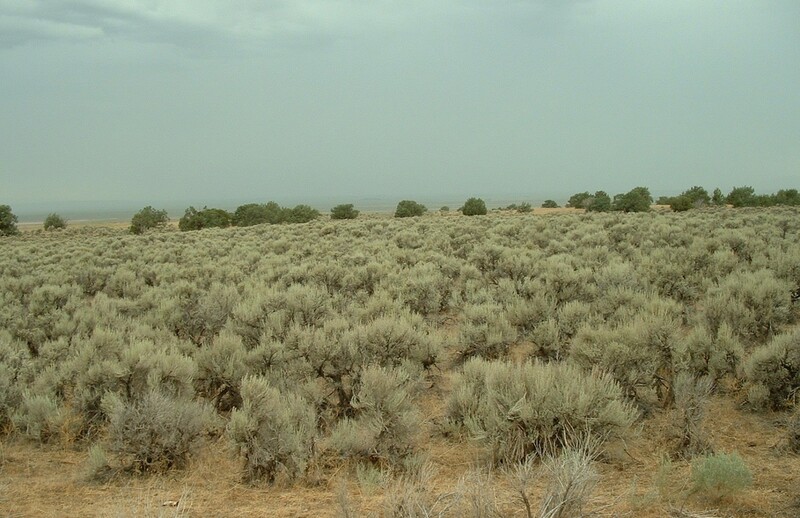 Here, the sagebrush stays short and finds little moisture . Notice the paucity of grasses and smaller plants. Pinion joins the juniper, here. 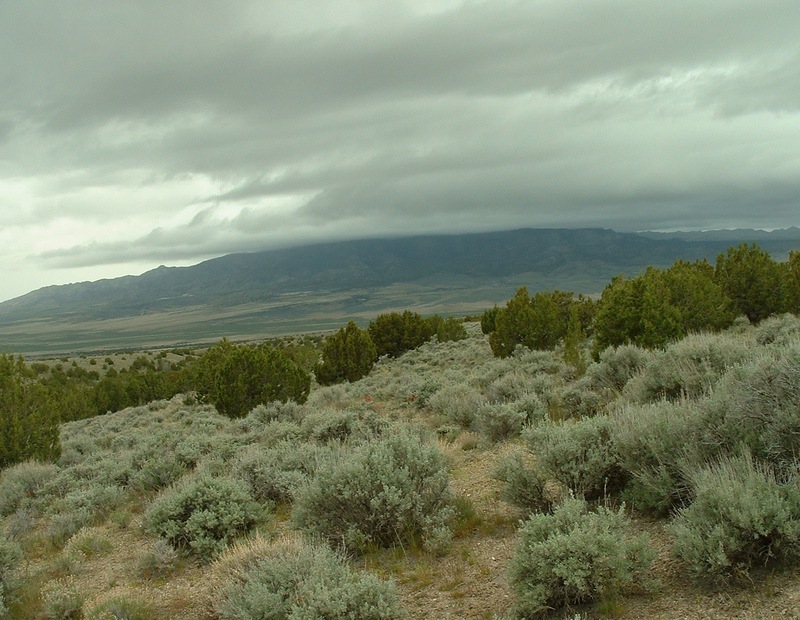 Juniper, pinion and sagebrush all occur here. 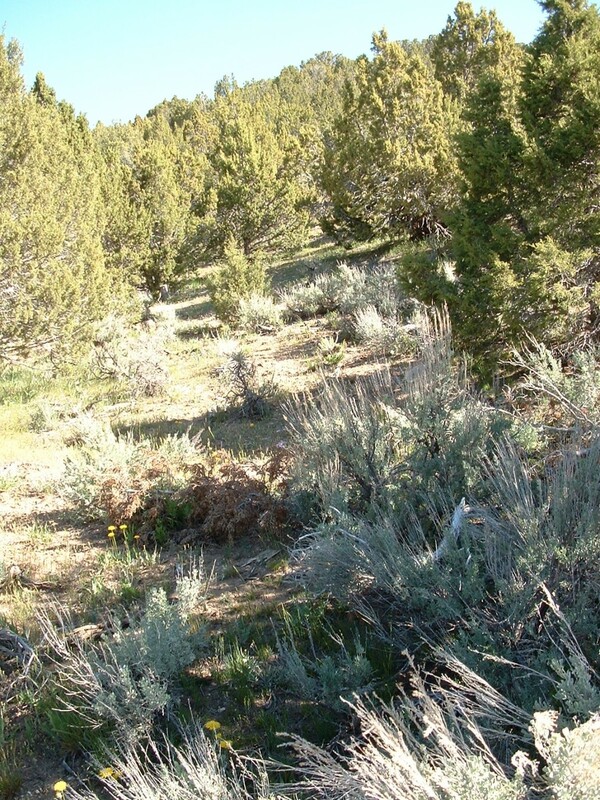 Here is an example of an area too dry for sagebrush and pinion, but not too dry for juniper. 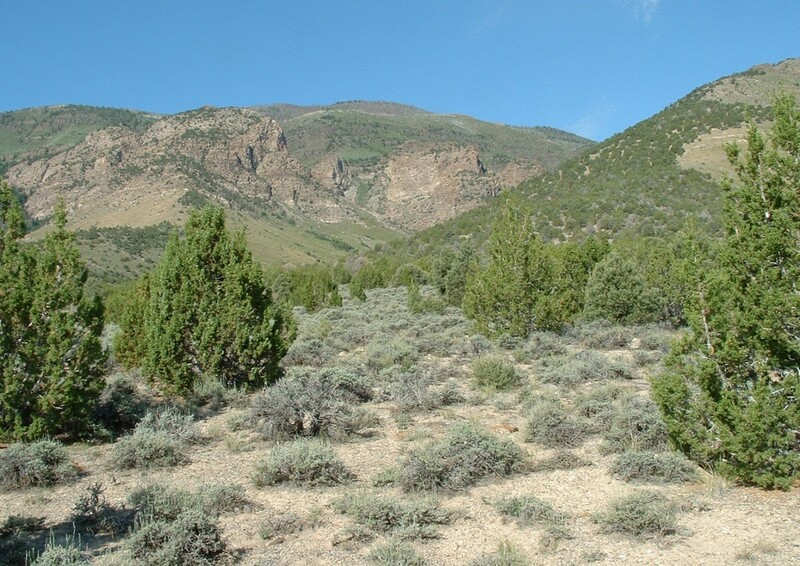 There’s no sagebrush on this E-facing slope where some juniper grows. There is sagebrush in the nearby canyon along the bottom of the wash. There’s no pinion in this view, but that species occurs nearby especially in N-facing areas of canyons that are sheltered somewhat from the heat. Notice the evidence of last season’s cattle. Here between the Simpsons and Keg Mtn there’s plenty of juniper (without pinion) among the sagebrush. 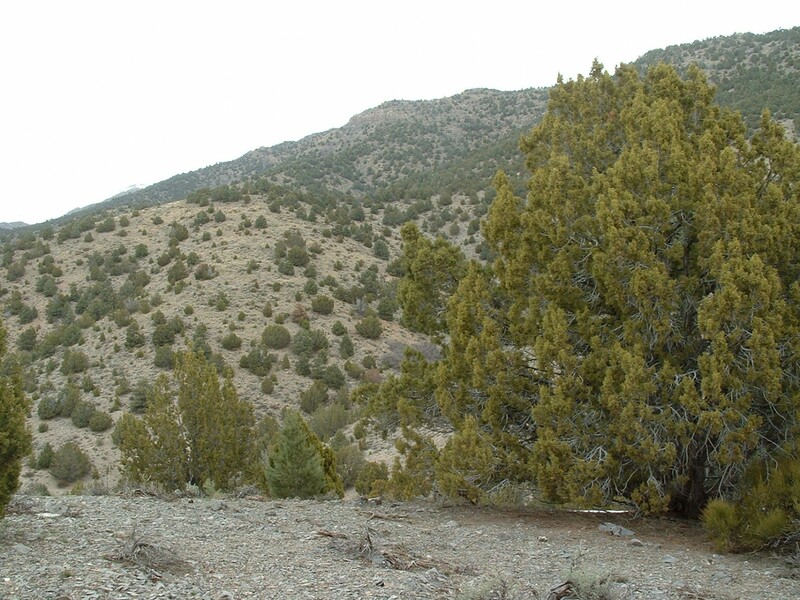 Some of this post’s other photos show juniper along slopes that may not represent the flatter sagebrush steppe habitat that sage grouse prefer. But this area shown here is probably flat enough that it would constitute sage grouse habitat–if it lacked such plentiful juniper. This shot is from the same spot as the previous photo, but faces N rather than SW. Here the sagebrush is taller. Notice the grass interspersed. There’s plenty of pinion (a mix of single- and double-needle) in the canyons of this mountain range, but lower down here the only trees not covered in snow are junipers. Here, the juniper is joined by a very small sprinkling of pinion in the most sheltered spots. It appears to me that some areas of juniper in this view have been killed. 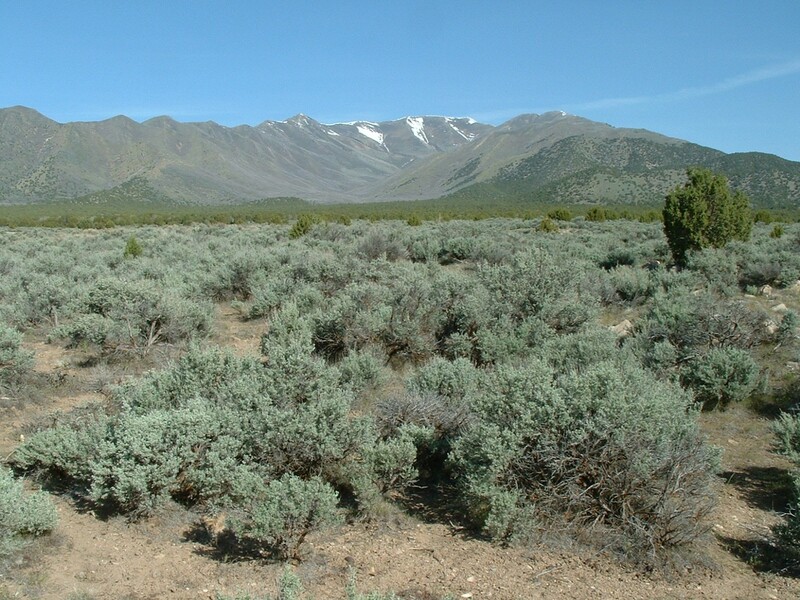 These slopes contain little sagebrush, but there is some. Unintentional fires can kill junipers, and such fires have impacted areas in the north half of this mountain range in recent years. Notice the green mormon tea (Ephedra viridis) shrub in the foreground. 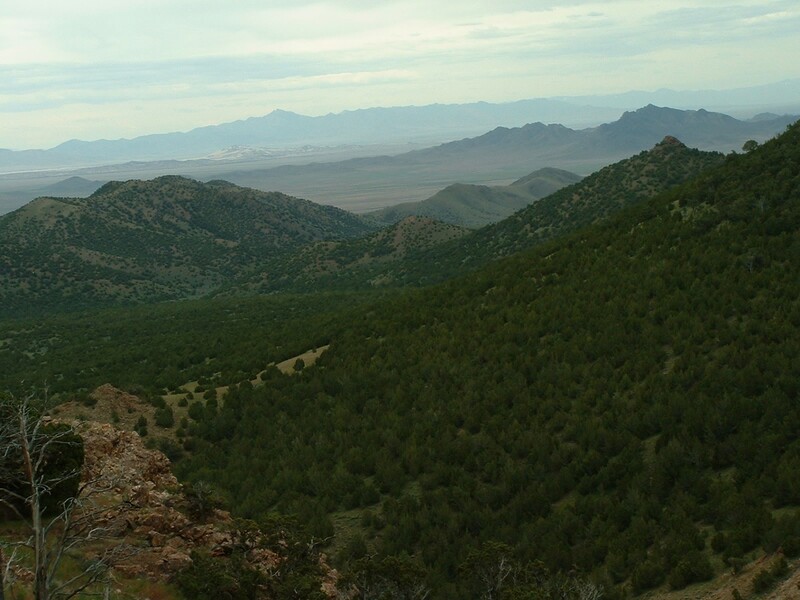 This BLM land is home to black angus cattle in the summertime. In the East Tintics’ lower elevations like this, no pinion joins the juniper. Notice some sagebrush in the foreground, but higher on the slope is primarily tight juniper. From the rocky knoll in the previous shot, you can face downhill and see this. No pinion among this carpet of juniper. 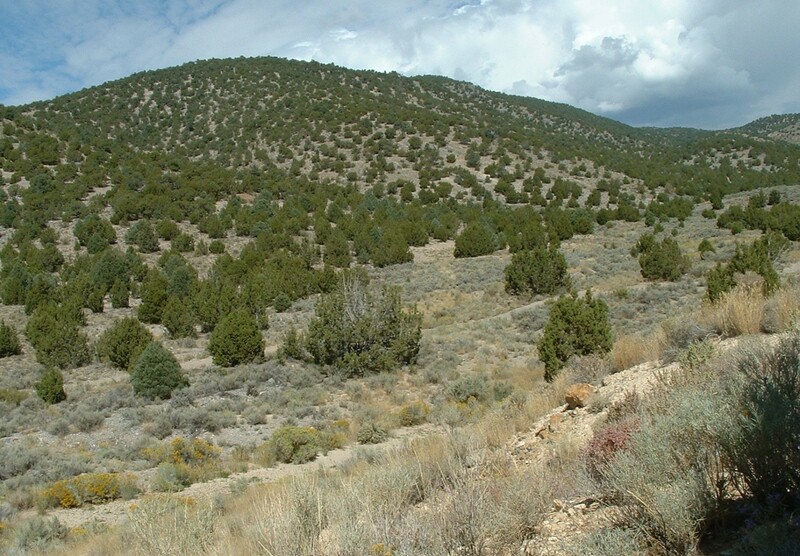 Here in the Oquirrhs is abundant pinion mixed with the juniper. At this elevation there is little space for sagebrush…but it does occur near this shot in some rockier and steeper spots.